Yep, you read that right. 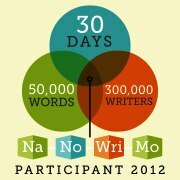 I'm doing NaNoWriMo this year. It starts tomorrow and the only thing I've done in preparation is daydream, because I'm good at that. I have the loose threads of an idea percolating but nothing more. It’s okay to not know what you’re doing. Really. You’ve read a lot of novels, so you’re completely up to the challenge of writing one. If you feel more comfortable outlining your story ahead of time, do it! But it’s also fine to just wing it. Write every day, and a book-worthy story will appear, even if you’re not sure what that story might be right now. So that's exactly what I'm going to do. Write every day, ignore my internal editor, and see if a book-worthy story ever drops in. I'm making this public declaration because I've heard "the looming specter of personal humiliation is a very reliable muse." I believe that. 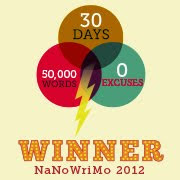 And because I'm an all-or-nothing commitment phobic procrastinator, I need all the help I can get.